There are many areas of work in which dangerous situations arise frequently, e.g. in the construction, oil and metal processing industries. Often maintenance or repair works have to be carried out under difficult circumstances. 1. The responsible leaders or managers carry out a thorough risk assessment. After weighing all the aspects, they find out that there is no other alternative than the use of personal fall arrest equipment. 2. Experts of safety at work equipment and technical specialists choose and purchase the necessary equipment, combining safety and comfort. 3. The workmen get intensive training for using the equipment correctly and they receive instructions for the official safety regulations in addition to those of the company. 4. The workmen receive the safety equipment and put it on according to the training. 5. The work begins as they reach the site of operation at height. Suddenly it happens: One of the workmen falls from height. If the rescue system works well, meaning the emergency doctor is called at once and manages to come quickly to the place of accident, the injured worker can be rescued and transported to the nearest hospital without any delay. The consequences are a catastrophe. The fallen colleague has severe injuries, leaving behind a shocked and suffering family as well as traumatised colleagues and leaders at work. All of them asked the same anxious question: “How could this possibly have happened?” Especially those companies with a long-term positive and excellent record of preventing accidents do not understand the reasons for this tragic event. They are convinced they have done everything possible to prevent accidents. What else could they have done? At a first glance, it seems to be true, but is this really the case? If you take a close look at the causes of accidents at work, it becomes obvious that in most cases they are not due to technical defects, inadequate management systems, or processes. Mostly, these falls from height are a result of the risky behaviour of the workers falling down. Interestingly, they very often are well trained and experienced in their jobs. Yet even though they should know better, they fail to hook in their personal fall arrest equipment at height. 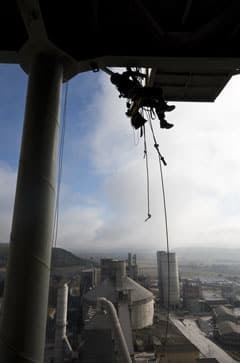 From an outside point of view this seems implausible, since working at height should normally imply a specifically careful behaviour. Evolution has provided us with a natural instinct to perceive height as a threat to our lives. Therefore, one should assume that we automatically act safely at height. Unfortunately, this is not always the case. The important question is: Why do humans act against their natural instincts and cognitive knowledge? The answer is that human behaviour is mainly based on experience. Let us imagine that we ourselves are working at height. In the first few hours or weeks – when everything is still new and unfamiliar – we would certainly feel some dizziness or at least insecurity. In the beginning, the safety equipment – hooked in at a secure point – would probably give us a feeling of safety. With increasing experience, however, the dizziness disappears and we become more familiar with the situation. At the same time, our confidence in our own capabilities grows, that is the mastering of the hazardous situation. Our brain saves the correct steps and hand movements as information for safe working. Routine starts to take over and our concentration is distracted by doing the actual work. After that, we also save the experience as information that we do not fall down because of our learned routines. Humans are under the illusion of being invulnerable. The more our experiences grow, the more we conclude that we do not need this safety equipment. Our memory strengthens our belief that we will not fall down. At this point there may still be a conflict between our own experiences and our knowledge that, in other companies, accidents actually have occurred. Even if our cognitive knowledge represents the experience of the majority of people eventually, our personal experience weighs more. Our inherent illusion of not having to expect any harm becomes overpowering. Why do these accidents often happen with experienced workers? When the awareness of our former insecurity fades and the positive experience of not having any accidents through routine behaviour is dominant, then an overestimation of our own capabilities becomes our inner guideline. We are under the illusion that we are safe and nothing will happen to us. Now the time of optimising our regulated work processes begins, while believing some of them are superfluous. The hook for fixing the fall arrest equipment, for instance, is perceived as an obstacle and only used according to our personal taste. We act like this because of our positive experience and our strong conviction that we know what is best for us. The risk for new employees mainly consists of a lack of routine for safe behaviour, whereas the biggest risk for the experienced workers lies in the fact that they substitute safe routines for actions based on their individual experiences. The substitution of safe routines is a slow process. For some time mistakes can be counterbalanced by attentive colleagues correcting them. Usually people are more likely to correct weak persons or those in need of protection. However, if in a team of experienced workers the number of colleagues neglecting the safety rules increases, the whole safety culture then disintegrates. The consequence is that deviance from the rules is tolerated tacitly, although the team trains them repeatedly and therefore knows them well. A subtle form of corps spirit develops. This means the team is able to present an excellent safety culture to the outside world while in the work reality – without the control of safety experts and outside the training rooms – much riskier work operations predominate. There are always situations in which companies are not able to develop their safety culture further and they need the support of external expertise. Quite often this is the case after a severe accident – although it should not really get this far. Our experience shows that most employees are open to a responsibly and carefully managed analysis by external safety experts, and they are willing to give insight into their ‘real’ safety culture. Experts have found out that even in so-called role model companies, safety rules are being ignored by employees on a regular basis. In addition, they frequently carry out their work in a highly dangerous manner. Why do people act like this? What is so important to them that they risk their lives against all common sense? A closer look at the problem reveals that the majority of the people not obeying the safety rules do not even feel unsafe. Apparently, humans are able to live with this obvious contrast: on the one hand there is the cognitive knowledge about the real danger; on the other there is yet a feeling of security. Humans tend to make life easy for themselves and rather ignore the correct way of acting, despite their knowledge. The motivation for this kind of behaviour is not always convenience. Improving one’s own work situation for a higher productivity, implying acting as an entrepreneur, is often a strong motive for pushing one’s own safety into the background of consciousness. Obviously, the concrete advantage within reach is more important than a possible disadvantage in the future. Consequently, this is true even if a dangerous fall from height is imminent, outweighing any potential advantage by far. Having found out that human behaviour is not merely driven by common sense, we conclude that we cannot convince people to act correctly by bringing forward reasonable arguments alone. Safety instructions offer a chance for open and transparent discussions about the meaning and practicability of rules. Many people regard the maximisation of safety merely as a means for avoiding risks. Consequently, they find them boring. It is much more interesting to look at the challenges and find strategies on how to cope with them instead of having safety instructions on rights, duties and rules for safe behaviour. By taking people seriously and asking their opinions, practical experiences and ideas on safety, we increase the chances that they will obey the rules. People like to be fully integrated and listened to by their leaders. So instead of boring employees to death by reading out rules they will have most certainly heard many times before, we turn the tables and ask them questions: How do you manage to make your work safe? What do you need for that? By addressing them personally, we appreciate them as professionals in their jobs and at the same time as experts for safety. Therefore, one important goal of safety instruction is to motivate workers to behave safely out of their own conviction. This is much more effective than conveying information. Let us rouse the employees to question the safety rules of the company. Sensible rules should replace rules that do not make any sense. At the end of this process, everybody should sign an agreement on these clear and binding rules. Safety culture always begins with the top management. One truism that everybody learns early at work is that if the boss declares a topic top priority, that means it is on the management’s main agenda. The way they communicate this topic to the employees is crucial to its acceptance within the company. Employees are quite sensitive to subjects exposing the management’s credibility, therefore, the importance of a topic also becomes obvious through assigning active roles to leaders. As the saying goes, Sisyphus should never be content with what he has achieved. Management and team leaders should never stop talking about safety at work. It’s obvious that the more frequently the boss puts emphasis on a certain topic, the more important that topic becomes to everybody else. So why then, do we not talk about safety more in our daily lives? It certainly does not imply a big effort, but it is a question of inner conviction and reveals the culture of a company. We should talk about improving safety as naturally as we would discuss high product quality or measures for cutting costs. Being a good leader implies repeating one’s commitment and showing continuous interest. Furthermore, it means being transparent with one’s expectations to everyone in terms of safety at various points. Confidence is good, but it cannot be a replacement for control. Managers can enhance safety culture with short, but easily recognisable signs at crucial points in daily work processes. Visits to industrial premises are, for example, a very effective tool for leaders to ensure safety compliant behaviour and adherence to the company’s safety rules. Let’s assume that the safety rules of a company are sensible and realistic. Then it is helpful for their acceptance if the employees recognise the background of these rules. Even more importantly, the employees should understand how crucial it also is for the benefit of the company to adhere to them. As is often revealed, employees measure the value of a rule by the consequences for breaking it. Defining rules and demanding compliance is one important aspect, however, the culture of an enterprise comes to a crucial point when faced with the treatment of those breaking the safety rules. The introduction of company-wide consequence management means a long term project. The method and duration of the implementation depend mainly on the company’s decisions. They could start with life-saving rules, being obviously extremely important. Safety rules for working at height are essential in saving lives. There is hardly any need for explaining the rules. On the other hand, at times they can be so complex that it is reasonable to comprise them in a short summary and to repeat them regularly. A good example for such a rule is “Always on line!”, a slogan that’s easy to communicate and memorise. In addition, employees just as well accept the rules of consequences in cases of deviation. Leaders have to comprehend the deeper meaning of consequences: they are a means to establish their care and responsibility for the employees. Their main objective is to prevent incidents. However complex the set of rules and whatever the consequences for breaking them may be, it is utterly important that all rules apply to all employees at all times. This is also valid for the rules of deviation.